Looking for a reliable storage device, be it store your pictures, favorite music or movies? Consider pen drives - they are easy to carry and comes with a variety of storage capacities. You can select from 4 GB pen drive to 32 GB and more based on your requirement. Buy pen drives online at cheap prices from your favorite online stores using offers available at HappySale. There are also a variety of styles available such as Fancy pen drives, key chain pen drives, credit card pen drives and much more. Printland is an online store where you can get all customized products to your choice. Buy promotional pen drives online of your desired GB at Printland and get best discount upto 25% off on your orders. Offer is valid for both new and old users. Here you can get this personalized pen drives at a best price starts from Rs 305. No coupon codes required to grab this best discount deal. Bag it now! A decade back, CDs and floppies were used to copy and store a wide range of digital data. But with the evolution of technology, these devices have been replaced with smart and sleek devices - pen drives. These devices are not just portable and handy, but they have now become an integral part in everyone’s life that requires smart device to store digital documents. 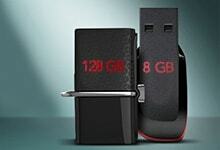 There are a variety of online stores that sell pen drives from different brands on their portals. To help you in getting the right price on your pen drive purchase, HappySale brings to you an amazing collection of discount offers on pen drives. A variety of styles in pen drives are available, right from fancy to classy collection. Pick the one that you think sure to stand out! Whether you are a student who needs to carry college notes handy or an entrepreneur whose most of the work is dependent on excel sheets and saving data, pen drives should be your go-to accessory. Advantages of these storage devices are endless. Because of stumbled upon this page, we hope you need one? Explore a fancy collection of these devices presented by popular online stores such as Amazon India, Printland, Flipkart, Shopclues, Infibeam, Snapdeal, Paytm and more. Make sure you pick the right pen drive based on the capacity and brand of your choice. Here are some of the popular brands in pen drives - SanDisk, HP, Sony, Kingston, Toshiba, iBall, Strontium and much more. HappySale presents fabulous collection of deals and offers on pen drives which are brought to you by top e-commerce stores in India. Before you buy from a store, ensure you browse the deals available on this page and make use of those deals and save on your pen drives online shopping.